Red Bull team principal Christian Horner says anticipated improvements to the team's Renault engine this year will create a "season of two halves". Red Bull failed to win a race in 2015 as Renault's turbo hybrid unit lagged behind those of Mercedes and Ferrari. But the French manufacturer's return as a constructor after buying out Lotus is likely to trigger "significant progress", according to Horner. "The first half is going to be less competitive than the second," he added. "I believe it will be a transitional year. I think we are going to start the year with some progress from the end of last season, but I think with our engine partner's commitment to buying a team we will see staged progress during the course of the year." Red Bull scrapped their previous contract with Renault amid last season's poor results and sought an alternative supply with Ferrari and Mercedes. After those negotiations failed, Red Bull arranged a new deal with Renault that will see the engines badged with the name of new sponsor TAG Heuer. Renault will be assisted in its development of the engine by British company Ilmor, which has previously acted as a consultant for Red Bull on engine design. Horner was speaking in London at the launch of the team's new 2016 livery, which featured a toned-down matt paint scheme. 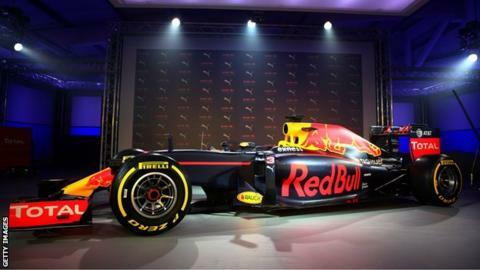 "It feels like a new era for the team, with a sharp new livery that's distinctive and is going to stand out on track," Horner continued. "Over the years we evolved a certain look but with the clean sheet of paper we had this time we decided to do something very different. "It's innovative and aggressive. It looks right and things that look good tend to go well, so hopefully we'll see that on track." The new livery was showcased on a previous season's car, with the team's new RB12 not due to break cover until testing in Barcelona on Monday. The new season begins in Australia on 20 March.